I've been looking around for an article just on this topic! Robin Good's Web-Based Delivery of Audio and Video Materials provides a great feature-by-feature comparison. of the most popular video sharing tools. He also tells us what users need to know before taking advantages of these services. some familiarity with the basic audio and video file formats existing out there. I really want to play with FlashMeeting but need at least two or three people with webcams. Anyone game? I want to compare it to skype with video. More on written acknowledgments and written disclosures is addressed in this publication. My post over at Katya's blog generated some excellent advice and has also raised many more questions. I'm taking a deep breath to capture the learnings and roll them into the next steps for my personal fundraising campaign on behalf of the Sharing Foundation's College Sponsorship Program and Leng Sopharath. My campaign goal is $750 by December 31, 2006. I'm sitting here in awe that you all have helped me raised $261 from 11 donors (Thurs. Nov. 16 AM) over the last two days. I can't tell how much it warms the cockles of my heart to see that little campaign thermontor go up! Have a question: I want to publically acknowledge the names of the donors here on this blog and what I don't know is whether donors opted to be anonymous or not? Is that built into the system? What's the protocol? My Cambodian blogger colleagues have linked or posted about the campaign. The key is to let people upload their own text, photos, or video about why they care about a cause and then link to the cause. It can't be about the cause so much as the messenger. I used the ChipIn campaign page feature. I created some template language to cut and paste into emails, skype/im pings, and thank you messaging, etc. I scanned, uploaded, and organized photos of Leng as well as our communications into photo sets on flickr. In the descriptions, I added the URL to the campaign page. I create two versions of the campaign video, one for YouTube and on Revver. I did two because ChipIn only integrates with YouTube on the campaign (the player can be easily emedded) and Revver because they pay users for content based on ad click thrus. I decided not to broadcast this out to everyone I know. I wanted to start with my blog readers and nonprofit tech colleagues and Cambodian blogger colleagues. Posted a guest blog post at Katya's blog soliciting campaign advice in exchange to share my learnings. I pinged some nonprofit technology and cambodian blogger colleagues via skype or email, asking for campaign advice. In the past, I've solicited mostly friends and family for fundraising causes. Soliciting professional colleagues is a little out of my comfort zone as I'm worried about crossing a line. That's part of the reason why I've shaped it as a learning opportunity. I've been flabbergasted by the generous donations from colleagues of their money, their advice, and links. These were initial questions jumping into this. I'm summarizing some observations, comments, and advice. What advice would you give to your supporters so they are successful in a group fundraising campaign? What do I need to think about? The message is really important and it has to focus on why you are passionate about the cause and the results of raising the money. If you're raising money for nonprofit, remember that you are an ambassador the cause and what you say and do reflects the organization. So, be sure to thank your donors promptly, etc. So, how do you give your supporters the freedom to run with it while ensuring that it won't backfire? I'm on the board of the ngo that I'm doing this campaign. At our last board meeting, we discussed online fundraising strategies and I made a proposal about using the fundraising widget and a campaign. Given that we're all volunteer organization and almost all our fundraising is grassroots - the approach was not a mismatch with our culture. have some beginnings of a checklist, templates, and worksheets. What internal issues does this bring up for you? I suspect in some, if not many, organizations - there may be some control issues. How much are do you have hand over control of the look, feel, and messaging of your campaign materials to the personal fundraiser? Will it still be authentic if you give template messaging? What happens if you don't like the way the personal fundraiser has represented your NGO? What do you do? My only concern about this down the road is that of potential misrepresentation. What is some jerk decides to go out and fundraise for my cause, collect money, and pocket it? Britt Bravo also brought an excellent question campaign tracking of widgets (to thank donors) and whether or not their gifts are tax-deductible. Personally, I would like the ability for the donations to be linked to TSF's DonateNow account or checking account. Is that possible? Also, can an email with EIN number suffice as a tax receipt? And, given that most of the donations are really relatively small gifts, do donors expect, want, need tax documentation. And, some of my donors are from outside US, so it may not be necessary in my case. What is the best practice here? What should I try doing next? I got some great ideas for the next round of the campaign that is if the internal issue questions don't stop me from going any further with this experiment. What do you think? I'm now reading and rereading marketing 101 advice like this and thinking about it. * blog about the progress of your ChipIn campaign so that you keep it in the RSS and search stream. And give those blog posts good technorati tags so people can find them. * drop emails to appropriate bloggers and ask ‘em to share your message. It’s amazing how many times a good message works on me. And on the bloggers I read. * Try to make connections with local college students in your area. They know the advantages of a college education, can relate to Leng Sopharath as a fellow student, and are tapped in to loads of social networks (Facebook, MySpace, et al). If they get excited by your cause, they can spread the word rapidly. College students are excellent small-time fundraisers, and will often throw benefit parties. * make sure that you publicize the fact that the chip in code is portable, encourage others to post it on their sites. * throw a fundraiser/houseparty. keep it simple - have some video you can show, ask folks to bring a bottle of their favorite wine or some cheese and their checkbooks (old fashioned, but could work especially around holiday time). * use your social network to help you with the campaign. Your goal is $750. If just two or three of your friends each posted the ChipIn widget with accompanying video, pictures and text to their site, you would now have four people all working to fundraise. * Continue to talk about the fundraiser in multiple posts, updating and describing the cause or event. * create some badges, wallpaper, t-shirt decals, etc. that could be available for free download from your site, making it easy for people to spread the word. Don’t know how do-able that is for you, but it’s a thought. This afternoon I attended a NTEN Webinar called "Video Your Message" by Michael Hoffman of See3. He gave an excellent over of the vlogging, web video, do-it-yourself versus hire a professional, and some references to equipment and software. After being up until about 3:00 a.m. editing a screencast, I was really relieved to he say "yes editing takes a lot of time." Whew, maybe I'm not stupid. One point he covered that I think is really important was the idea of using video regularly to document activities over time, assemble that as a library and use the material for messaging. This organizational translation of Jay Dedman's "moment sharing" concept - you film moments over day but when assembled they tell a story. Michael Hoffman also encourages nonprofits to think about video as not being for one place. He made a distinction between vlogging and viral web videos. He made the analogy that vlogging is like cooking shows and the reason cooking shows are popular is because of the host's personality - not the recipes. He said the holy grail is viral video because it gets beyond the choir. A great question to ponder from another participant: "What should an organization ask itself to determine where or not to use vlogging or video?" He mentioned the time commitment to learn the technical and story telling skills as well as experimentation time in social networking sites like YouTube. He referenced some metrics - such as testing and tracking video with email distribution. 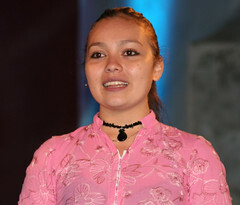 Maria Estela Godinez is currently studying high school in her hometown San Francisco del Rincón, México. She lives with her mother, a single parent, and five other siblings. Her passion is electronics and she is putting her passion to work for a good cause. Maria Estela built a glove that allows speech-challenged people to move their fingers in a similar fashion to Braille language and have those signals recognized by software that converts them into speech. One of my blog readers, Ricardo Carreon, a blogger living in South America and working for Intel offered to translate an email interview I did with her in Spanish. 1. How did you get interested in electronics? The Deyabú project forced me to learn more and more about electronics. The more I learned, the more I discovered how fascinating it was to me. At the beginning I drew my designs mixing things like protoboards and connection diagrams. I started to apply electronis without knowing exactly how they were used, but I was focused on trying to solve problems. Then in a summer course I learned how they were used, but really the interesting thing was to learn what happened when you applied electronics, in other words, the phenomenon that it produced. The more I know about electronics, the more passionate I get. It has grown on me spectacularly. ¿como te comenzaste a interesar en electrónica? El proyecto Deyabú conforme comenzó, me exigía cada vez más electrónica, ahí la conocí y me resultó fascinante. Al inicio dibujaba el protoboard en lugar de dibujar/crear el diagrama de conexión, comencé por aplicarlos directamente sin saber porque solo lo utilizaba para resolver el problema, hasta que en un curso de verano aprendí para que se utilizaban, pero realmente lo interesante fue aprender el porqué se a aplicaban y qué era lo que sucedía, es decir, el fenómeno que lo producía. Entre más conozco de la electrónica, me sigue apasionando e interesando de una forma espectacular. 2. How did you come up with the idea for speech recognition software/hardware? What was your inspiration? Why the gloves? I began developing this project under the direction of Jose Carlos Tovar, an engineer who was my coach and adviser. He had experience working on diverse projects directed to blind people, for example Darshan or PC Lazarillo. The conventional computers do most of their interaction in a visual form, so if we want computers to be useful to blind people we most adapt their software and hardware. My greatest motivation was not the award at all. It was the knowledge that I acquired when I was involved in the creation process. That discovery process can also help other people and this is what has inspired me to keep going. Blind people use their sense of touch like one of their main senses. Blind people know the world by their hands because they use them for most of their activities. Como dise con la idea de lenguaje en software y hardware? Comencé en el desarrollo de proyectos gracias al ing. José Carlos Tovar, quien fue el asesor. Ahí han trabajado con diversos proyectos anteriormente también dirigidos a personas invidentes, por ejemplo Darshan PC Lazarillo. La computadora convencional se muestran los procesos de forma visual, así que se debe aprovechar ls demás sentidos de los invidentes, y en ellos el oído y el tacto son primordiales para su conexión con el mundo, por esto es que debe adecuarse el software y hardware a las capacidades diferentes de las personas diferentes. Qué ha sido tu inspiación? En el proceso de la creación de un proyecto, he descubierto que la mayor aspiración/inspiración, no es llegar o subir a un podium, sino que esté es el conocimiento que adquieres cuando estás en el proceso de creación. Sabiendo qué este pueda ayudar a las demás personas. 3. How much time did spend working on the project? August 9th, 2005 to July 28th, 2006. Cuanto tiempo trabajaste sobre el proyecto? 4. Was there a time when you thought "this won't work, I have to throw out my design and start over?" Yes I did feel that way a lot of time. I felt uncertainty when constructing a project. But you see it, you feel it within you, and you cannot leave it. A project, since its begining is like a baby that needs to be nourished to grow. This close relationship with the project makes you stronger and gives the strength to move forward when things don't work out. ¿Había un tiempo cuándo pensó "esto no trabajará, yo tengo que tirar mi plan y volver a empezar?" Siempre a cada momento, esa es la incertidumbre que se juega al construir un proyecto. Pero lo ves, lo sientes dentro de ti, y no lo puedes abandonar, ya que la creación de un proyecto, se puede ver como un bebe que no puedes dejarlo solo en la vida, que necesita de ti para crecer, y en ese momento piensas y continuas con mayor fuerza. My goal is to continue to development this project, to try to obtain greater good out of electronics, and to decide if it is the correct career path before entering the University. 6. What advice would you give to other young women who want to work on technology and electronics projects? That they should never give up. If you reach a moment when you think it might be impossible to continue, you must see, think and to believe in everything that lies ahead. If you have the will to find a solution, there is not problem that can't be solved. qué consejo daría usted a otras mujeres jóvenes que quieren trabajar en la tecnología y proyectos de la electrónica? Qué jamás se den por vencidos, que hay un instante en el cual parece ya no poder continuar, por esto debes ver, pensar y creer en todo lo que continúe adelante, no existe problema que no se pueda resolver. I'm the guest blogger over at Katya Andresen's Getting to the Point Blog Nonprofit Marketing Blog this week. I've created a real life personal fundraising campaign for the Sharing Foundation using chipin widget and I'll be sharing what works and what doesn't. With your help, expertise and guidance, I know we can make 100% of the goal! This is uncharted territory. Think of me as one of your organization’s supporters who has grabbed your organization’s fundraising widget and set it up on my blog. What advice would you give to your supporters so they are successful in a group fundraising campaign. What do I need to think about? What is the checklist? What should I try doing? What internal issues does this bring up for you? What a deal! I’ll make all the mistakes, potentially look stupid, and we’ll reap the benefits of learning together! And, if we're successful, we'll be sponsoring Leng Sopharath's education! So go over the Katya's blog for the full context and thank you! I'm thinking about the use of video or vlog posts coupled with fundraising widgets as well as some other possible ways (ad revenue from web videos?) to raise money for sponsoring a college student in Cambodia via the Sharing Foundation. I did a campaign video. I'm going to be guest blogging about this effort over at Katya's Non-Profit Marketing Blog this week. I'm going share my experiments and what I am learn and of course encourage your suggestions and tips for making this campaign a success. What a deal! I'll make all the mistakes, potentially look stupid, and we'll reap the benefits of learning together! I wanted to capture a few thoughts and pointers about using video for fundraising pitches on the web or grassroots participatory video coupled with grassroots participatory fund raising. I don't know what I mean yet. I've seen several terms, like "crowd funding" etc. One of the newer entries into the video hosting game is Revver. Revver actually pays you for your content based on advertising placed on your work and the click thrus. I read on Netsquared about how Creative Commons is trying to raise money with its video on Revver and am trying it out. I don't anticipate that it will earn much more than what is in my son's piggy bank. They take 50%. And so far, I've earn like .37 cents. But every little bit helps and even pennies go far in Cambodia. Nancy Schwartz invited me to submit a piece for next week's Carnival of Nonprofit Consultants theme on "Using Social Networking Tools." So, I'm sharing a little getting started advice, a mini-case study, and a list of resources. I've been experimenting quite a bit over the last 18 months way too many social networking tools. 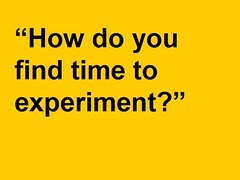 I realize that finding the time to experiment for many of us can be difficult, especially if those experiments do not lead to direct outcomes. And, there is so much to experiment that one person or organization can't do it alone. Nancy White has mentioned the need for a network of experimentors, and perhaps that could be a future Carnival. This particular Carnival raises the question of how to decide which online social media tools to use and ramp up your skills using it. I don't think there is a cookie cutter approach yet -- a fish to toss at you. Sorry. It takes some action learning, small focused experiments where you track, evaluate, and learn from before investing more time and effort. Or even to convince someone else of the proof of concept. Choosing which of these tools to adopt starts with outcomes, strategy, message, and knowing your audience - and nothing to do with the tools. So the issue is more how to best match your strategy, outcomes, and audience with the right tool and what type of simple experiment can you set up and what will you learn? While there are some obvious easy tools to get started with first, like Flickr, for example, you have to be ready to invest a little bit of time in some thoughtful experimentation. 2. The rule of threes: Identify and explore a tool and commit to learning three things about it in three weeks with at least three other people in your organization or your peers. Make it fun. Most of these tools are not difficult to learn how to use, but it does take some "play time" or "getting to know you time." What you are looking for how best to interact with the community as well as the techniques. Katya Andresen has written a fantastic five minute guide to social networking tools. Read it. 3. Set up a small experiment: It doesn't have to an exhaustive experiment. Define something small and tangible - whether it be a flickr photo contest or exploring the content related to your organization's issue and identifying 10 friends or contacts. Identify 2-3 questions you want to answer from your experiment. There's lots of examples in this blog. 4. Set a Time Frame, Track it and Talk about it: Make sure you activate the tracking system or install an external tracking system like site meter, bloglog, or Google Analytics. Look at your data for answers. In addition, have a conversation with the three people who joined you - what did you learn? What should you bring forward? Should you trash this tool and go onto a different one? I interviewed Tuesday Gutierrez from SaveGuimaras over at blogher. What I didn't include was the indepth conversation we had about how she has explored and used social networking tools. SaveGuimaras is a group of individuals who are dedicated to raising awareness on the recent oil-spill tragedy in Guimaras, Philippines. Because the international community and media have failed to respond to this environmental disaster, they are bringing the campaign to the Social Web. Their goal is to mobilize grassroots participation by using online networking tools and their blog. If you check out their blog, you will notice that the group has a presence on myspace, friendster, YouTube, and few other communities. Tuesday shared some of her learnings with me about using these tools. She has been the most successful when the tool matched her audience and outcomes. And, she had to go through a bit of experimentation to learn that! 1. How have social networking tools helped spread the word about your cause? Friendster is a very popular social network in the Philippines. Almost everyone I know has a Friendster account and its very easy to find people, influential or otherwise in Friendster. When I opened a saveguimaras account, in less than two weeks, we had 200 people who signed up. What´s good about Friendster is that everytime a "member" of your group posts a new entry on your blog, you receive it on your email/ and you see it right away on your Friendster page. This led me to stumble upon Roy Alberto/Joseph Alberto who was a co-founder of 1 fish entertainment who was promoting a rock gig for Guimaras and that was how our relationship started. MySpace hasn´t taken off like Friendster because the Filipinos I am targeting there are based in the US. To invite people in Myspace is also painstakingly difficult unlike Friendster that you just click a button and invite. Myspace avoids spamming so the members usually blocks people from adding them directly unless you know them personally or their email. So what I have been doing is sending out mails one by one! YouTube is also good in finding videos about Guimaras. Its pure luck too. Project sunrise, the provincial government led organization (supported by Canadian Urban institute) happened to post their videos and I was given permission to post them in the blog. The IFCP (Independent Filmmakers Coop) in the Philippines just had their Guimaras Short Film project which was shown on television and some moviehouses in Manila. YouTube would have been more helpful for my cause if people in the Philippines have home videocameras and if they have a fast broadbandwidth. Unfortunately, the journalists on the field are still using pen and paper technology which explains why there are not a lot of videos about Guimaras. Because regional flights are more expensive, people from Manila who are supposed to be more technologically equipped do not come to Guimaras to shoot videos/photos which also explains why there is a lack of photos uploaded in Guimaras at Flickr. I rely on photos sent to me by the filmmakers and some journalists on the field. Mobile technology is more popular in the Philippines and we are looking into how we could use this platform. The only difficulty I find here is that SaveGuimaras is not a non-profit org and is simply running as a webblog therefore, mobile networks might not trust us enough to collaborate with us. Care2.com has been helpful in a way that other social networks have not been. Although it is difficult to find people or connect with care2.com members, whats good about their system is that you can send out letters to ten members each and for me its much better to send out ten letters once than sending out letters one by one. And yes, I've painstakingly sent out letters to care2.members ten at a time. I'm only discoveriing about Flickr. Personally I think Flickr is useful if you are two or three in a group but if you're only one person like me running a blog for a social cause, you need something faster. 2. How has your blog connected you with people to help with your cause? Through this blog we´ve met so many wonderful people who all have the passion and the drive to help the victims of Guimaras. Some have their own projects already in place before they´ve contacted us but we´ve also managed to link people with the same agenda and get them to collaborate with each other. Some organizations have also written expressing their willingness to collaborate with SaveGuimaras and its partners. For example, Chromatic Experiment, a Filipino band contacted us thru our blog. They are willing to play for free for future rock gigs planned by the team of Joseph, Sazi and Laura (There are more people involved behind this team, but for the sake of brevity we will only mention these three). 3. This is the bonus question and please do not take offense. I've noticed that a lot of folks from Phillipines are really into social networking apps and lots of wonderful communities in places like YouTube, Flickr, etc. Why do you think that is? of the Philippines is very bleak. BTW, we are the no. 1 text messaging capital aside from the fact that sending out text messages is always cheaper than making an actual call. I've been collecting good resources on social networking tools in my del.icio.us account and point to a few good ones I find every week for my NpTechTag Roundup over at Netsquared. So, I've attempted to pull out a few introductory articles, books, research, and blogs that might help inform your experiments! This article on idealware, Using Social Networks to Stop Genocide by Ivan Booth is an excellent and detailed case study. Danah Boyd writes about Social Networking Tools and Media. You should subscribe to her blog to keep up. She has organized some of the "best of" content here and her research papers here, which is a good place to get grounded and context. Marc Sirkin writes the NPmarketing Blog and Katya Andresen writes the Non-Profit Marketing Blog - both of them write about nonprofits and social networking tools. Too other must-read blogs are Getting Attention by Nancy Schwartz and Spare Change by Nedra Weinrich. ( Note, Nedra writes about "social marketing" which is different from 'social networking," but her blog has valuable information for both topics.) In addition, several UK bloggers are focusing on nonprofits and social networking tools are also must reads - Steve Bridger, David Wilcox, and Nick Booth. 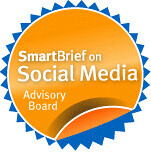 For tactical suggestions, I'd recommend the Influential Interactive Marketing's Blogs, Social Media Optimization Tips. That's about it from for now. I'm working on a scaffolded list of resources for about dozen or so social networking tools that I've experimented with ..
a big hat tip to Michelle Martin from the Bamboo Project for pointing me to these two articles in the business press about widgets. Ultimately, widgets, like the web itself are about connections— between people sharing content and between companies and sites that host content for people. The post also answers the question: Why would you want to install widgets? Widgets offer a lot of ways to enrich the experience you offer readers on a targeted or topical blog. If you run a financial advice blog, for instance, a live stock ticker might be useful. How about weather information or flight schedules for a travel blog? Widgets are a great way to share the things you like on the web. There are a variety of widgets that offer options for community building, participation and live chat. There are widgets that allow you to run ads on your blog, recommend products you like or track and display auctions. The truth is, there is something for just about everyone that can be created in widget form, and in some cases, if you can't find it and don't know how to build it, you can request it. I think the greatest value widgets offer is the ability to add functions and services that aren't built-in to existing blog platforms. ... By distributing the load of development and hosting, widgets inspire and promote a grassroots effort to design software around the needs of users. You get what you build, ask for or hire out. And rather than causing software bloat, widgetized software elements are something that you only use if you find them useful. It goes on to talk about how widgets will ultimately create personal platforms for niche topics. Finally, he points over to Fred Wilson's blog (Geocities) and his use of widgets on the side panel. Beth, our tool crack dealer. I'm going to have to blog that quote, Beth! Fair warning. I think we DON'T all have time to experiment and it is at times an addictive behavior. For me, the only solution is to have a network and we spread the experimentation out amongst us. I am reading your stuff on 2nd Life, for example, not yet jumping in myself. If we can't do this as a network, we'll NEVER get past early adopters, IMHO. Last month, I was the Arts and Technology Conference at a session on funding technology projects. One of the panelists spoke about the importance of peer networks to support nonprofit technology needs. After the session, I shoved my camera in his face and asked him to repeat what he said. I recently set up an affinity group over at NTEN called Nonprofits and Flickr as an experiment to see if there was an opportunity to set up a peer group not only share knowledge but the experimentation. Right now there 35 folks from nonprofits who are interested in sharing information about how their nonprofit uses flickr or are seeking advice as prelude to using flickr. There's been a great conversation about flickr and some experiences shared. I took it one step further and setup a flickr nonprofit playshop group on flickr so we had a sandbox to actually play with it. We're just in the early stages of the group, but I had some visions of doing nonprofit flickr experiments like the librarians have done. How does the network keep enough coherence across a diverse set of adoption (or rejection) patterns? I also wonder how we keep the network coherence with poorous tools like blogs, tags, etc. Also found in the 2ndwave tag stream something to explore in a bit. The above powerpoint is from 1999 and excerpted from day-long workshops I used to lead when I worked at NYFA and design and ran a program called "KIT: Knowledge in Technology - Technology Planning for Arts Organizations." Before we jumped into the technology tools, I always covered technostress. It is really about how individuals within the organization could be more comfortable with adopting technology tools. It got at the human barriers around technology adoption in the early days: stress, fear, anxiety, frustration. What happens when you don't have the time to experiment or play so you feel comfortable? Since the participants were from arts organizations, we made them draw pictures of what techno stress look like. I would scan the pictures and embed into my presentations to do the debriefing - and overtime would have user-generated content in the curriculum! One of my favorite drawings was the metaphor of being in a foreign country and not being able to speak the language. I went searching my harddrive for that visual after reading Katya Andresen's Five Minute Social Network Guide where she used the analogy of travel in a foreign country to explore social networking tools. "to most of us (including me), social networking—using the web’s latest and greatest ways of connecting to people—feels akin to being a stranger in a strange land. People have their own customs online, they act differently, and it can be hard to find your way around. It seems so foreign and intimidating. At least it did to me, until I figured out I should simply apply the same skills of assimilation I’d apply anywhere else outside my experience." She goes on to introduce her travel analogy and link it to exploring social networking tools. Somehow that's connected to what Nancy is talking about in Second Wave Adoption and what Michelle from the Bamboo Project refers to do in her recent post about technology adoption and nonprofits. Katya Andresen of the Nonprofit Marketing Blog left me a message on Odeo in response to the question "What do you think about widgets for building community, in particular fundraising widgets?" "I think widgets are a great way to build community if you are authentic about it. I mean you put the widget in the hands of the community. We're doing a little experiment with personal fundraising widget at Network For Good this season. The key is to let people upload their own text, photos, or video about why they care about a cause and then link to the cause. It can't be about the cause so much as the messenger. People want to use widgets to be messengers whether it is a fundraising vehicle or poll." I tracked down Web/Internet Strategy expert, Michael Stein, to get his take on widgets for fundraising. "When I think about web widgets, I think about the potential they have for online fundraising campaigns. I think they are excellent tools for organizations that want to reach beyond their existing stakeholders via email, blogs, web sites, etc because of potential of viral marketing. What I think is exciting about widgets is that they allow an individual, an organization's supporter or volunteer to do the fundraising on their own by using the widget on a blog or email and pushing the campaign message out to wider audience. I'm thinking about services like the ChipIn widget and other examples where you have a tool that potentially empowers an organization's supporters or anyone else for that matter to do the fundraising. Widgets carry with them information about the campaign that is much more rich than text or even a graphic email. This can be video, graphics that show contantly updated information about the fundraising goal. It is a creative way to empower an organization's supporters or individuals to spread the campaign message and help raise funds." It lets users associate themselves with their favorite blogs, build a profile page about themselves and send internal messages. By default MyBlogLog users join the community of a site using MyBlogLog after ten visits to that site, but you can increase that number or require manual joining. Blog publishers can show a badge on their site with pictures of the most recent MyBlogLog members to visit the site and can display the five most popular outbound links from their blog on the blog community page. 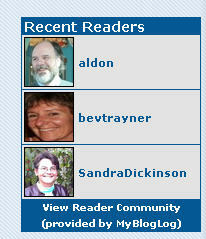 Click on any of our readers’ pictures at the bottom of this post and you can see what an individual’s page looks like. I've been playing with this widget for about week and think it has some potential for community building or at least the ability for your readers to get to know one another. It also provides you with some decent stats on who has visited, most popular outbound links, and it offers some social networking functionality. That said, there are some creepy aspects to it that I don't like. It’s a little creepy to think that just because I’ve joined the community around one Gawker blog, MyBlogLog knows every other URL I visit on the web. They really need to take tangible steps to demonstrate trustworthiness with that information - and I need ultimately to be in control of the data. Aside from being a little creepy, I'm not sure what value it brings. But then again, it's only been a week so far. I'll have see what happens in a month or two. NPTechTag Roundup: Election Debriefs and Wikis in Your Kitchen! What we can learn about online politics from the 2006 Campaigns from e-politics offers some lessons and takeaways about social networking and other traditional technology tools deployed for political campaigns. An interesting point about using MySpace: "It can definitely be used for recruitment and as a mass communications tool, particularly for younger voters who tend to use email less. The key is to move MySpace friends onto normal advocacy lists as soon as possible. It will be interesting to see if this advice holds true for the voters of the future based on Dannah Boyd's post "What i mean when i say "email is dead" in reference to teens. "Do young people have email accounts? Yes. Do they login to them semi-regularly? Yes. Do they use it as their primary form of asynchronous communication for talking with their friends? No." RootscampSL got off to a great start the day after election day. Events continue through Nov. 15th including a session on using Machinima to create political and social change videos. And here's another "vertical" video host -- Capitol Hill Broadcasting Network. CHBN provides a free service for broadcasting member-generated political video content. Here's a clip of Joe Trippi explaining how web media tools are impacting political campaigns and movements. Check out Nancy White's Second Wave Adoption thats creating waves in the educational technology and nonprofit technology blogosphere. The concept is simple as Nick Booth writes: "Some people really get it and move quickly to innovate in the way they collaborate online. Behind them comes another wave (or wavelet) who are not so keen and are much harder to bring on board." (And, if you're wondering how Nancy embedded her powerpoint, she did it with SlideShare (more here). There's still time to contribute a post to the Carnival of Nonprofit Consultants compilation of Nonprofit Use of Social Networking Tools. Meanwhile Randal Moss gives us some food for thought about turnover in Social Network sites. For some context, check out this timeline of social networking sites from Dannah Boyd. Social Bookmarking Showdown is a quick overview/review of the major social bookmarking services. Meanwhile, library geeks are talking about tagging. The Commons is a free collaborative online newsmagazine about non-profits that serve the Silicon Valley, the people behind them, and the people that they help. It is written, edited and produced by students and other volunteers in the valley. It launches with an 11/11 orientation. What I really like that they are providing extensive help, including screencasts and live chat. They understand what's needed to encourage adoption. On a lighter note, take a few minutes to view this hillarious video, WikiKitchen, on how to turn your kitchen into a wiki. Love it! The ABCs of Podcasting from PND covers how Web sites of public radio stations, museums, and other education-oriented nonprofits are turning to podcasting as an increasingly popular and inexpensive way of delivering audio programming. Steve Garfield offers this advice when selecting a video host for your videos: Be aware of where you put your Creative Commons Non-Commercial videos. (An the choices continue to multiply, this beta from AOL, uncutvideo. And if you don't want to give your content over to corporate giants or get paid pennies by having ads slapped on your stuff, maybe just created your own little YouTube with ning and there is always hosts like this and this. Lost in Light is a videoblog about small gauge filmmaking featuring home movies, work by artists, articles by preservationists and film scholars, video tutorials and other film gems. Its part of the "Have Money Will Vlog." These are examples of vlog or blog raising - raising money from people via your blog. The nonprofit techhelp blog creates a customized search of nptech blogs here. YouthNet Blog which offers insights into youth issues, volunteering trends, charity life and more in the UK. Podnosh from Nick Booth who is writing about nonprofits and social networking. And while we're looking at Web2.0, Nonprofits, and the UK - check out this article from the ICT Hub on Web 2.0 by Simon Pavitt. According to Websitesthatsuck.com, this website was one of the worst and it's a nonprofit! Wonder whether the worst blog in the world is from a nonprofit too? Don't forget to tag your blog posts, flickr photos, videos, and tasty links with Nptech tag! I found this in flickr tonight in Nancy's flickr stream. It made me think about a post-it note from almost ten years ago! It's here The context- arts educators in a workshop looking at how can they integrate the use of email, web pages, or google searches into their practice. The tools have changed, the issues remain the same and are similar for teachers as for nonprofit workers. Why not just jump off the cliff and have some fun experimenting? Beth Kanter turned me on to this neat new service... and we're going to let it fly for a whlie on our LLS myspace profile. So, momentarily, I feel like a crack dealer to nonprofits ... that they are doing something wrong experimenting. But how else will it get embedded into nonprofit practice unless someone takes a few minutes to hit the pause button, set up a tiny experiment, and see what happens? By simply believing that these channels have future (or present) value, we simply make some time to get to know these systems and how they work. Each site is different - LinkedIn has a different vibe than Myspace - and very different users. Once we think we understand who is using a given site, we'll decide either to jump in or not... that's when we start to experiment by joining different groups, creating our own profiles and becoming part of the community. At LLS, our success with myspace does mean some staff time - so we've divided up the responsibilities but have given those folks ownership to experiment and "play." Experimentation is the highly technical term that I use when when I'm spending time doing things that have no predictable outcomes. Myspace, along with Second Life and things like MissionFish are good examples of "experimentation." In the case of LLS's use of myspace I feel like part of the experiment is figuring out how an org (vs. a person) actually participates in a community. As it is, LLS is not posting bulletins, Marc, Peter and Ralph are. That said, I think we've tapped into something worth exploring - be it a long tail effect of LLS communities, or something wholly new we're not yet sure. The honest truth about how I make time for it is... I have no idea. I carve out an hour a week and just play. If you are asking if I have permission - then I'd respond by saying that I don't need permission to do my job. It's my job to be innovative, and to bring new ideas to the organization - and then figure out how it fits and how to execute. Translating strategy into action is where the action's at. Not for nothing, I also use a lot of personal time. My passion is to make the time to experiment. 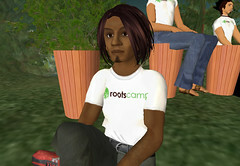 RootsCampSL got underway yesterday and I attended the start up meeting. Rik has a good post here. Ruby Sinreich is one of the organizers. The session I want to attend is on November 12 from 1-2 PM PST and called "" Using Machinima for Social Change / Political Action" lead by Paul Marino. I have a board meeting for my Cambodian NGO, but I'm hoping I can make it there towards the end. 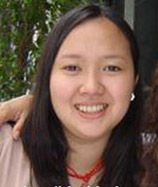 I interviewed Tuesday Gutierrez from SaveGuimaras over at blogher. And, she interviewed me for Oh My News! Tuesday has done a lot of experimenting with using social networks to promote her cause and we had an extensive conversation about that which I'm going to include in my a post for the Carnival of Nonprofit Consultants on Social Marketing. So, stay tuned. BTW, light blogging today and tommorrow as the schools are off! At around 3:00 p.m. today, I took a break from working on something else and decided to summarize a bunch of conversation threads on social media, social media burn out, listening, second wave adoption, and participatory nonprofits that are flying around me so I could begin to make sense. There's connections and it is still in the fuzzy stage. I got pinged from Steve Bridger and then discovered David Wilcox's Wow to How and finally landed on Podnosh's (Nick Booth) "Let me Catch Up." He he, they're all asleep ... and I can pay it forward or just take a deep breath. It's almost bedtime for me. So, I'm opting for deep breath. Unh? The whole process can seem absurd to some. Take what I’m doing at the moment (hardly a cutting edge example). I’m writing about some thoughts shared with me by someone I know (David), someone I ‘met’ yesterday through a comment on this blog (hello Beth) and a complete stranger (hello Nancy). I know that what I’m doing is refining my own understanding of all this stuff and at the same time building potential relationships with others. Both those things makes sense to me and I also believe they may have some economic value. Podcasting also makes sense to me because i see talking as the most direct way to share ideas. But for loads of us this all seems nonsensical. Where are the tangibles? Via the Pulling for the Underdog blog comes a pointer to KarmaTube from CharityFocus. I've been wondering whether there really is good karma on YouTube. There is a discussion going on about this topic and again it is important to read the terms and conditions of the video hosting sites you use to see if you are handing over the rights to your content so they can make money off your videos. There are some private discussions lists too, like OurTube. Social Media Burnout: Too Much of a Good Thing? I happened to pop out of reader today and cruise through Marnie Webb's sidebar links from Ma.gnolia to land on an interesting article from Monday's SF Chronicle called "Social Sites Becoming Too Much of A good Thing." The article uses the term "Social Networking Fatique" and the trend about younger people cutting back their use. If you believe the buzz, the latest incarnation of the Web is all about sharing, connecting and community. Social networking sites such as MySpace and Palo Alto's Facebook have exploded in popularity, drawing new users into the fold each day .... But even as the phenomenon continues to swell, the effort to maintain an active social life on the Web is taking its toll. Some have grown tired of what once was novel. Some feel bombarded by unsolicited messages, friend requests and advertisements. And some are cutting back. The article goes on to point that while the novelty is wearing off for some social media consumers (aka "younger people" or what has been dubbed "digital natives"), it doesn't necessarily mean that people will stop using them alltogether. A good point made based on research was: "Social networking Web sites are relevant to people at different times in their lives." The article describes briefly what some of those needs are and how they change as younger consumers grow up. What this means is that while one consumer group may move on or cut back, another is growing up and will have a need to use them. The general expectation is that consumers ultimately will settle down with one or two social networks and that they will become a feature incorporated in more and more sites. YouTube, the popular online video-sharing site, and Flickr, an online photo-sharing site, for instance, include social networking. "I think it's been both overhyped and underestimated," Dogster's Rheingold said. Although some lofty expectations about how big of a business it could become won't pan out, "in the end it is going to be so much bigger than what people are seeing now. Ian Wilker makes some excellent points about the need for listening skills in using social media so burnout doesn't occur. "Those tactics are just the same old "push" marketing in social-web contexts. People will develop resistance to it, and quickly. I think a much better strategy is to pursue richer, more authentic relationships with constituents." This echoes what Allison Fine writes about the skill of listening in her book Momentum: Igniting Social Change and my favorite quote in the book: "Using social media without changing how we think about social change will only create more noise." Ian goes onto suggest hwo use the tools with a different approach: "To really open all the doors and windows and let your staff and constituents mix it up in social-web contexts -- blogs, video- and photo-sharing, etc. Empower your constituents -- let them design your t-shirts, give them tools and assignments to help advance your organization's work. Get your staff and supporters out into the social-media spaces you want to have a real presence in -- and ask them to spread the word and through their personal networks personally engage with potential supporters. Give them badges, even xml-driven widgets that feed back to the world the actions that individual user has taken and the impact those actions have had"
Steve's last comment on the post suggests that the seamless integration of all the tools is necessary, but also laments the lack of second wave adoption. Steve's original post over at his blog offers us some wonderful tactical and practical suggestions for what a "buzz director" (I don't like that word .. sorry Steve) and skill sets. What does a "listening and participatory" culture in a nonprofit look like? What's need to make a shift towards that? Is this just a new name for a "learning organization?" Will the nonprofit sector see second wave adoption in this generation or will be a generational shift that occurs over the next 20 years? What are the small steps that an organization, if the culture permits, can take in using social media tools effectively without having the staff feeling social media burnout? Steve's post offers some great ideas. What is the checklist of criteria that a nonprofit can use to determine whether or not social media (minus the buzz word bingo bullsh**) might be an appropriate strategy or not? What are the realistic outcomes (both short-term, mid-term, long-term) that an organization might hope to see if employing social media strategies? Share what you learn with colleagues and network with people in other organisations who sit in seats like yours to identify new ways to calculate the benefits, costs and risks of blogging. Work with them to create a framework for measuring the ROI of your blogging efforts. Join the search for a new metric for engagement. Second Wave Adoption from Nancy White! The slide show comes from Nancy White (I've had slide share on my list .. and thanks for showing it off ..) "I have been thinking about six practices around tool adoption. They are sort of embedded in this slide show, but I don't think they are clear enough yet. So here goes -- just a bit of thinking." That's the conclusion. She starts off with a post that summarizes what she and her colleagues have been writing about as it relates to "Second Wave Adoption" and online collaboration. This has been bubbling in the back of my mind, but looking at nonprofits and adoption of social media tools or what I started to call the participatory nonprofit. Are we focusing on the right value to the people we are asking to use these new tools and ways of working? How do we stimulate people's imagination to try new things, like tools and processes that may be of use? How do we trigger inventiveness with new tools?I definitely have some thoughts on this, but need some breathing space to surface them. What Nancy's talking about is a shift in the use and tools. I can't put my finger on it, but some of it some relates to the MacArthur Foundation's birth of a new field ... but instead of learning for children, it's learning for adults.